I’m an old school kind of guy, and I think everyone who follows me on Twitter and reads my blog (and knows me as a person) knows this. I like highlighting, scribbling (by hand, on paper). I write handwritten notes. I keep just one notebook, my Everything Notebook. I carry index cards, highlighters, fineliners, pens and my Everything Notebook everywhere I go. Therefore, I am sure that it will come as a surprise to absolutely nobody in the entire world that I still write bibliographic references, quotations and thoughts on index cards. Yes, small (3″x5″), medium (4″x6″), and large (5″x8″) cardboard, ruled index cards. In a previous blog post, I had shared how I take notes, but I am not 100% certain that undergraduate students would actually find my blog post very useful, since it’s been a very long while since I last took a class. I graduated with my PhD years ago and I’ve been a professor for a pretty long time, so I thought that maybe I needed to settle down and clarify my ideas of the process I follow to take notes. In this series, I will share my processes to take notes using different methods. 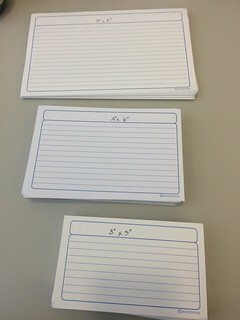 The very first method I use is the Index Cards Method. Other authors have referred to the process Niklas Luhman followed (Zettelkasten ). Hawk Sugano has shared his Pile of Index Cards (PoIC) method as well. Mine isn’t all that sophisticated, and since I combine my very analog Everything Notebook and notes in index cards with digital synthetic notes, memorandums, Conceptual Synthesis Excel Dumps, and Evernote, I don’t know that my system would be extraordinarily systematic. But here goes more or less how it works. I produce at least 5 different types of index cards, which are more or less the same categories other folks have all agreed upon. Here are some resources on taking notes in index cards that I found useful as I was trying to make sense of my own system. I use index cards to write direct quotations (with page number and full bibliographic reference) from articles, books and book chapters I find useful. This card is the analog equivalent of my Synthetic Note method. It’s rare that I do this one anymore because I have been using Mendeley and EndNote as reference managers for more than 15 years, but this was my study method and strategy to conduct research before: I would write the full bibliographic reference in a 3″x5″ index card. Then I would write a small paragraph on the back summarizing the entire book, or at least, the main idea behind it. I find that these are useful for when you’re studying for an exam, testing your ability to recall, or when you’re giving a talk without reading a set of Power Point slides (e.g. when you’re leading a seminar, using each card as a theme for the seminar). I also use them to remind me of key authors who discuss particular themes and topics. As I said on Twitter, this is very rare for me to do, and I usually combine my own types. This type of index card is a summary of a particular journal article, or book chapter, more than of an entire book. As its name indicates, the Content Index Card is a combination type of index card that includes direct quotations, draft notes and ideas, conceptual diagrams, etc. that are all associated with the main article, book chapter or book discussed in the index card. I use larger (5″ x 8″) index cards for those cases. There are obvious questions that people ask me, so I’ll try to answer them here. 1. Can you do digital index cards? For sure. You can either do combinations as I do (physical index cards, then row entry in a Conceptual Synthesis Excel Dump row), or all digital (either in Evernote or simply in Excel, or synthetic notes or memorandums in Word or Scrivener as you may choose). 2. How do you store and classify index cards? I usually have boxes that fit my index cards, and add a plastic tab with the reference in Author (Date) format. Other people use different classification systems (by keyword, by topic, by author). I just recommend that the process be consistent across. 3. When should I use memorandums and synthetic notes and Excel Dumps, when should I write in my Everything Notebook, when should I craft index cards? This question has such a personal preference type of answer. I'm always stressed and under pressure to write, submit, revise and publish papers, but I have slowly come to the realization that it's better to let my thinking simmer and evolve, and mull ideas over, and writing by hand helps me do exactly that. So, yes, I do write index cards. Can all this process be digital? Sure thing. Even a combination can work. You could scan your index cards into an optical character recognition thingie and store the digital content into Evernote, tag it and easily search through your bank of notes. Or you could simply type them. 4. What size of index card should I use? This is again, a personal preference as I note in my tweet below. I do teach my students the Index Card Method of Note-Taking because I believe it is important to learn the old-school techniques, but also because I find that it helps me, and I strongly believe that if it helps ME, then it may also help THEM. In subsequent blog posts I’ll share some of my note-taking techniques when using my Everything Notebook, and other types of media. You may be interested in my other posts on taking notes, which you can access by clicking on this link. Tagged with index cards, note-taking, taking notes.